AFRE is a non-profit organization in the State of Georgia, USA, and an International Non-Governmental Organization in Consultative Status (Roster) with the Economic and Social Council of the United Nations. At present, AFRE is funded by contributions from individuals and groups in sympathy with our work. The organization is administered on a volunteer basis with public contributions used primarily to support travel to the UN at Geneva, and to various other meetings and conferences. 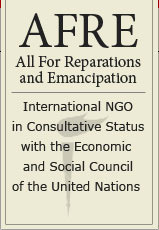 The work of AFRE, on behalf of Afrodescendant human rights and reparations, requires that administrators and supporters give of themselves and their resources. We hope that you find our efforts beneficial to all peoples and worthy of your generous support. Contributions are tax deductible and a receipt will be provided upon request.